Another fantastic melodic release that’s blowing me away. 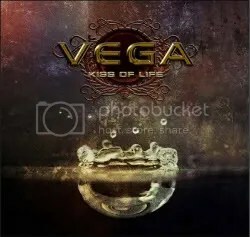 Vega is a project put together by writers/musicians/brothers Tom & James Martin (they’ve written songs for House of Lords, Joe Lynn Turner’s Sunstorm and Khymera). They recruited Nick Workman for vocals, who had previously sung for the melodic groups Kick and Eden. Has anyone else ever noticed how many side projects there are in the melodic rock world? No one seems to have a full-time band! Everything is always a “project” and not a band, but oh well, as long as the music is good who cares! So this is the second great melodic album I’ve heard recently (the first being Prime Suspect). This album is everything AOR should be. If more bands could put out albums like this, I would become a huge AOR fan. Sadly, I don’t think many people are gonna come close to touching this UK act! So what’s so great about this album? Production, vocals, keyboards, just the songwriting in general… Melodies and hooks galore! Choruses that will have you screaming from the rooftops! Okay, maybe that’s going over board but the songs are very catchy. Every song on here is a winner and touches you on some level whether it’s uplifting anthems like “Into The Wild” or “Kiss Of Life” or ballads that tug on your heart like “What It Takes”. The lyrics are great too, I love all the positivity (not that AOR is ever negative but these particular get stuck in my head and speak to me). I’ve seen some others talk about how this is great “British melodic rock”. I don’t know what that means. I just know that it’s melodic rock and it’s a fantastic album that I’ve spun about 8 or 9 times in the past week! Though the genre seems to be stuck in the ’80s sonically, this is one of the finest melodic rock albums you’ll hear outside of that decade.